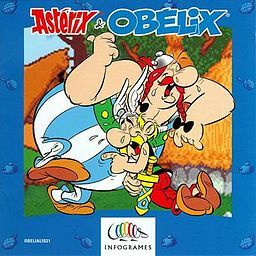 Asterix and Obelix is a side-scrolling action game. It starts with Asterix, for instance in the village (Getafix, Geriatrix and Vitalstatistix can be seen) and moves on with the player going in the forest and beating up the Romans. Later, the player gets a message from Britain and must cross the sea. The game takes place in different countries, including Britania, Helvetia, Grecia, Egyptia and Hispania. The aim is to guide Asterix or Obelix through each level until they reach the end. Both playable characters can jump, run or attack enemies, which are mostly Romans.